It appears that one of Doctor Who’s oldest enemies, the Cybermen, will be responsible for the regeneration of the Eleventh Doctor in this year’s Christmas special. The episode – due to start filming any day – will see the end of Matt Smith’s tenure in the BBC’s 50-year-old science-fiction drama series. He will have spent four years in the role. His successor, Peter Capaldi – who was announced as Smith’s successor live on TV last month – is expected to make his first official appearance as the Twelfth Doctor towards the end of the as-yet-untitled episode. Regeneration has become central to Doctor Who ’s longevity. It allows, periodically, for the lead actor to be replaced by someone who looks completely different, without the audience having to suspend disbelief – à la Miss Ellie in Dallas, Stephen Carrington in Dynasty – in accepting that the character has a different face. As highlighted on Digital Journal yesterday, the first-ever Doctor Who regeneration scene was featured in 1966, when William Hartnell’s First Doctor collapsed and changed into Patrick Troughton’s Second. That story, The Tenth Planet, was also the first to feature the Cybermen, meaning that this year’s regeneration story will, in a sense, have taken the story full circle – appropriate, given that it’s the show’s golden anniversary. Prior to the Christmas special, Saturday, 23 November will see the premiere of the already-recorded 50th-anniversary special, which will see the Doctor, once more, up against his oldest enemies, the Daleks – last seen in Asylum of the Daleks (2012) – who are also celebrating their 50th anniversary this year. The episode is directed by Nick Hurrn (The Girl Who Waited) and stars Matt Smith, David Tennant, John Hurt – all as different incarnations of the Doctor – Jenna Coleman and Billy Piper – as his companions, Clara Oswald and Rose Tyler, respectively – Jemma Redgrave as Kate Lethbridge Stewart and Joanna Paige as Queen Elizabeth I. As with the anniversary special, the 2013 Christmas special is written by the Doctor Who ’s head writer and executive producer, Steven Moffat. It features Matt Smith and Peter Capaldi, both as the Doctor, and Jenna Coleman, again as Clara Oswald. 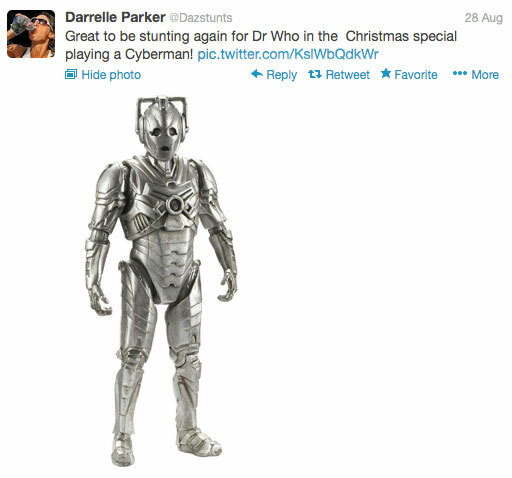 Directed by Jamie Payne (Hide), it is the ninth Christmas Day episode in a row and the fourth to be penned by Moffat. The previous five were scripted by his predecessor, Russell T Davies (Queer as Folk).